Baird & Warner has announced the five local nonprofits that will be receiving a total of $120,000 in grants through its philanthropic initiative Good Will Network. Chicagoland nonprofit organizations were nominated by various members of Baird & Warner. The top five winners were then chosen through a public online vote. The $24K of Solid Good program was launched last year and provides $24,000 to five nonprofits that provide support services and shelter for the homeless population, and help those with disabilities and special healthcare needs. 360 Youth Services in Naperville delivers life-changing services to youth through substance abuse prevention education, counseling and housing. Almost Home Kids in Chicago and Naperville offers transitional care in a home-like setting to children with complicated health needs, training for their families and respite care. Bridge Communities in Glen Ellyn connects homeless families to partners to provide mentoring, housing and supportive services. 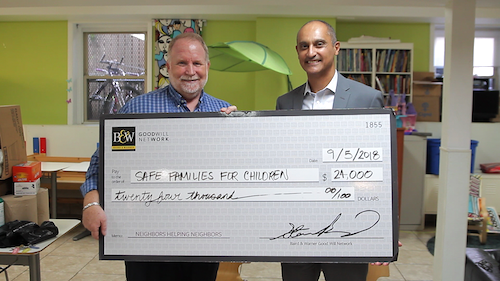 Safe Families For Children in Chicago facilitates network to temporarily host children and provide a network of support to families in crisis while they get back on their feet. A Safe Place in Zion helps domestic violence survivors transform their lives through intervention programs and educates the community about domestic violence to support prevention.